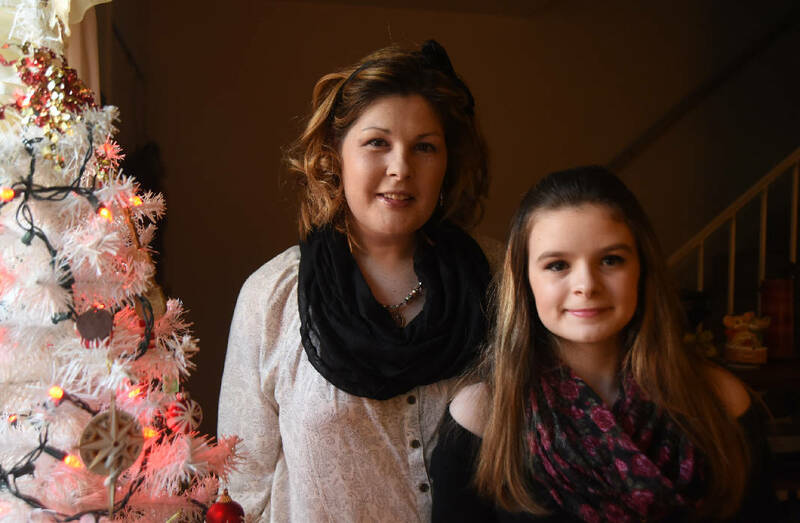 Sarah Hixson and her daughter, Alaina "Ally" Hixson, stand in their home Thursday, December 3, 2015. Paying funeral costs after her parents' deaths left Sarah Mae Hixson alone and without means to pay routine expenses. "It's hard to be in the funeral home and nobody shows up but you and your daughter," she said. "There is no shoulder to lean on." Just when Hixson thought she was without help, the Neediest Cases Fund gave her $230 to pay her electricity bill one day before the scheduled cutoff date. Call 423-757-6208 to make a tax-deductible donation or go to timesfreepress.com/news/neediestcases/2015. The 33-year-old disabled single mother is counted among hundreds of families assisted by Chattanooga Times Free Press readers who donate to the Neediest Cases Fund. During the 2014 season, readers raised more than $47,098, which helped some 300 families. Rachel Gammon, executive director of Northside Neighborhood House, calls the Neediest Cases Fund a "huge blessing." "When there are gaps in what we're able to do because of limited resources, the Neediest Cases is a perfect compliment that extends our resources to people in need," Gammon said. Chattanooga Times and New York Times publisher and owner Adolph Ochs started the fund in Chattanooga in 1914, two years after he started it in New York. Meeting a homeless man after taking a walk on Christmas night in 1911 prompted the idea of publishing stories about people in need and starting a Neediest Cases Fund on their behalf. Hixson calls Northside Neighborhood case manager Alex Redmond an angel for referring her to the fund. "Alex bent over backward trying to help me," she said. Hixson is one of 3,200 clients the Northside Neighborhood House assisted this year with basic needs like food, shelter and utilities. Money from Neediest Cases helped the Northside Neighborhood House extend its assistance. "If there had not been resources like the Neighborhood House referring me for extra help, I don't know where I would be," Hixson said. She plans to share her story about how the fund assisted with other Neighborhood House visitors. Hixson's mother and father died this year only months apart. She took financial responsibility for both of their final expenses while continuing her daily duties of caring for her schizophrenic brother and her mentally disabled daughter. Her brother and daughter live with her. She cares for them while disabled herself with multiple sclerosis. Hixson was a former nurse, but her condition leaves her unable to work. She said she's still financially unstable, but because of resources like the Northside Neighborhood House and Neediest Cases, she will celebrate the Christmas season in a warm home with her basic needs met.